Turmeric is native to India where it is an essential herb in both Asian cuisine and traditional medicine. The rhizome is rich curcuminoids, most notably curcumin, that are responsible for the bright yellow colour of curries and most of the medical research focus on these compounds. Turmeric has numerous medical actions, but it's primarily used as an anti-inflammatory and antioxidant. Research shows that turmeric and its active compound curcumin are as effective as anti-inflammatory drugs in the management of joint pain and osteoarthritis and have fewer side-effects. Also, this anti-inflammatory effect shows potential for treating neurodegenerative diseases, particularly Alzheimer's disease. Historically, turmeric was used to treat inflammation and infections of the digestive tract. In addition to its anti-inflammatory actions, it possesses some carminative, antimicrobial and antiulcer effects. Both animal and human clinical trials show turmeric has promise in treating inflammatory bowel disease (IBD) with most of the studies showing improvement in ulcerative colitis. Thousands of research studies have been published testing the effects of turmeric and curcumin against various types of cancers. Curcumin has been shown to induce apoptosis in a variety of cancer types and also has been shown to decrease the side-effects of certain types of chemotherapy. 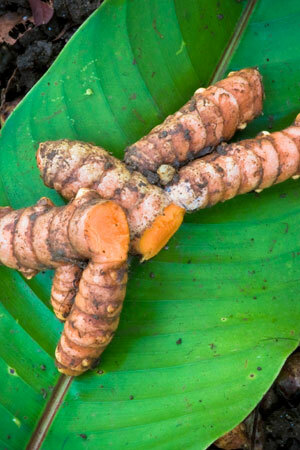 Numerous clinical trials show that turmeric improves outcomes with cancer patients.